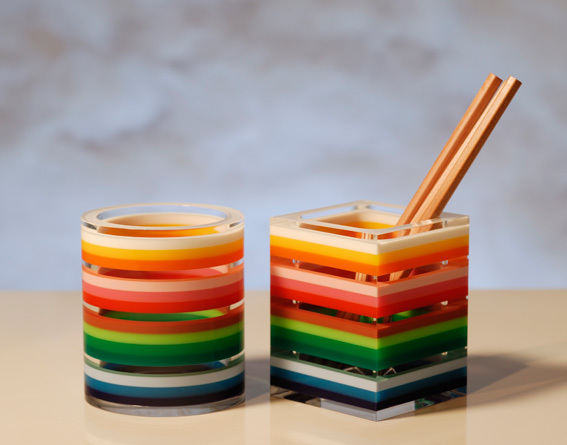 Mix and Chic: Cool products alert- Crazy for colorful acrylic! 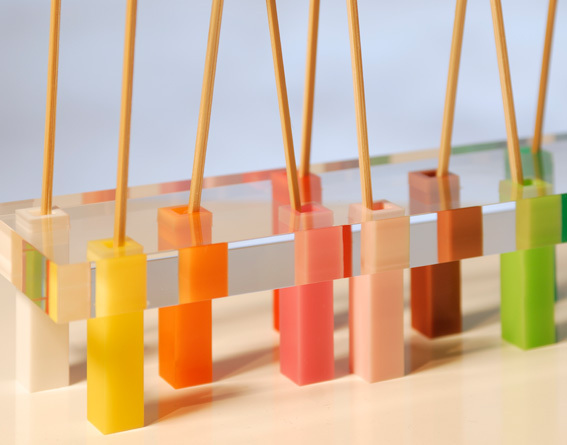 Today, I am featuring some of my favorite products made out of colored acrylic. I thought these products are cool, modern, fun and unique. Enjoy these fabulous eye candies below! 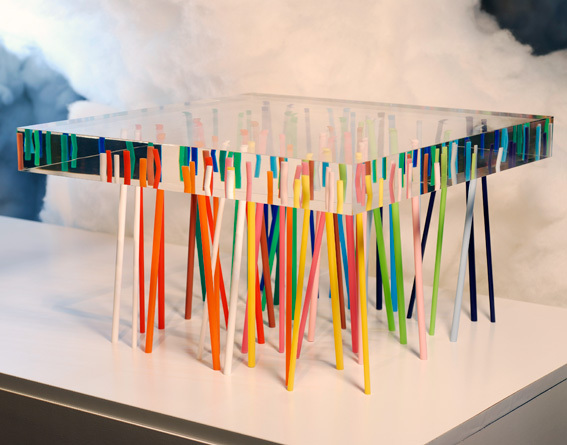 This amazingly unique and gorgeous table is made out of 56 slender, colored acrylic sticks, embedded randomly into a piece of transparent acrylic. 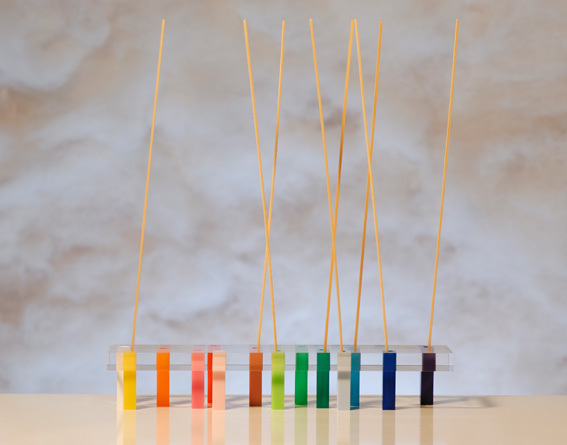 The sticks support a transparent acrylic panel, while refracting and reflecting light as if they were soaking under water. I am in love with this one-of-a-kind coffee table. It's definitely a conversation starter for sure. 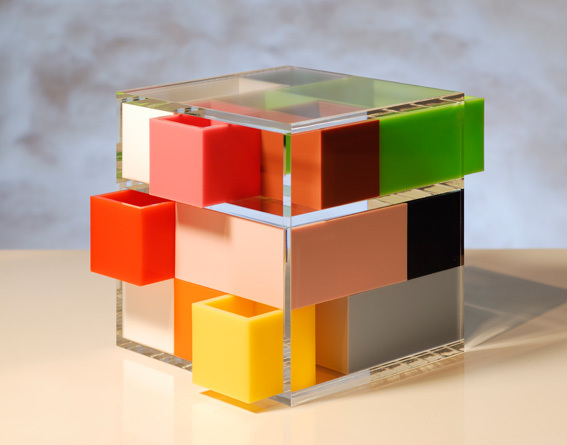 This colorful "puzzle box" is an accessories box inspired by Japanese tiered lunch boxes. The parts can be arranged freely like a 3D puzzle and it allows for compact storage for cosmetics and accessories. It is also ideal for storing small stationeries and other small articles. I think these beautiful boxes with compartments are perfect for earrings, rings, bracelets, necklaces, lipsticks, paper clips, erasers, extra buttons, pencil sharpener, etc. 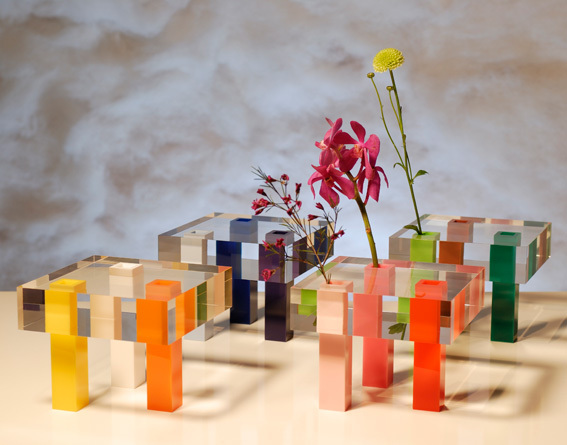 With four different pretty colors as a set, they are perfect as home accessories too. 'Kodachi' is a stand for fragrance sticks. 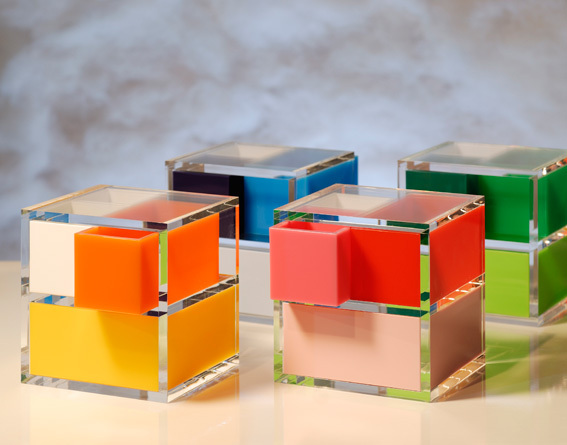 Its colored acrylic boxes are rhythmically embedded into a larger transparent acrylic box, creating beautiful illusions. I think this can be used as a lovely vase for single flowers, too! What do you think? 'Kodachi' is a stand for flowers. These are such wonderful vases, perfect for creating an uncommon flower centerpiece in a unique table setting to impress your guests for all occasions. 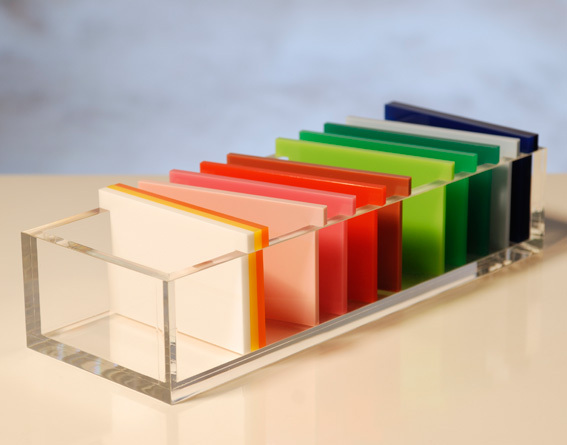 "Shikiribako" (a word play in Japanese meaning "box divided by colors" in English) is a transparent business cards holder, divided by beautiful layers of color. Not only it adds color to the desk, it makes arranging cards fun. These 12 colored dividers are detachable as well. My most favorite is the brilliant 'Shibafu Table' followed by my second favorite, the adorable 'Puzzle Box'. Which one is your favorite? For further details regarding these products, please visit www.emmanuelle.jp. The pen/ brush holders. Kasani! very artistic all!! Wow, Jessie, this looks absolutely amazing! I just fell in love with the pen holder and the vases! I´d LOVE to have them in my office! This looks fun! I like the puzzle box! Very cute! All the colors are so pretty! Love the table- so much fun! So creative and unique. Love the colors! Jessie, you find the most amazing and interesting objects, we must have very similar taste. That table is brilliant! So fun! love the coffee table in the first image! M.
A hit here and there could definitely add some fun to a room! The vases are my favorite. I think my favorite is the vase. I have a thing for acrylic! How fun! I'll have to go check those out.